Ever since Tetris was used to deploy tens of millions of Game Boys into households across the world, puzzle games and handheld hardware have had a tight relationship. You’d be hard-pressed to find a handheld launch without a puzzle game of some sort on offer, but virtually none of them have been as important to their hardware’s launch than Tetris was for the Game Boy. If you had to find a runner-up, however, the original Lumines on PlayStation Portable would surely be it. On hardware that offered some of the best 3D graphics that you could fit in your pocket, somehow the shining star of the system’s early life was a falling-block puzzler. Granted, it was an incredibly stylish falling-block puzzler with an outstanding soundtrack. I don’t know many PSP owners who don’t have some kind of nostalgia for the game. 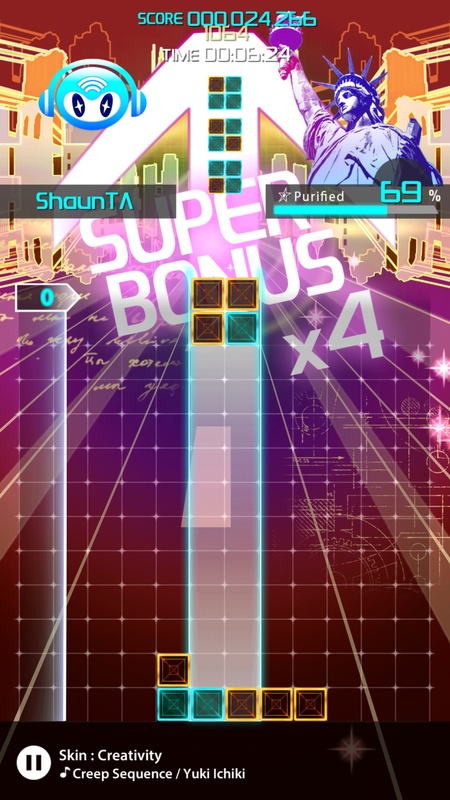 The success of the first game, particularly outside of Japan, kicked off a series of Lumines releases across various platforms. The PSP got a direct sequel with some interesting music choices, the PlayStation 2 and PC got modified ports of those games, the Xbox 360 and PlayStation 3 saw follow-ups on their respective digital stores, and the PlayStation Vita received the lovely Lumines Electronic Symphony, which sadly failed to recapture the sales lightning in a bottle of the original. 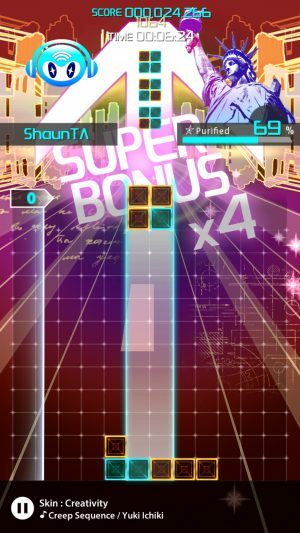 On the pocket telephone end of things, Lumines Mobile was released for a few different feature phones in 2006 by Gameloft, while an iOS version of the game, called Lumines Touch Fusion came out in 2009 from series creators Q Entertainment themselves. Puzzle games have had a pretty good time on iOS, but that particular version of Lumines didn’t come out so well. It had the style, it had the music, but the controls just weren’t where they needed to be. 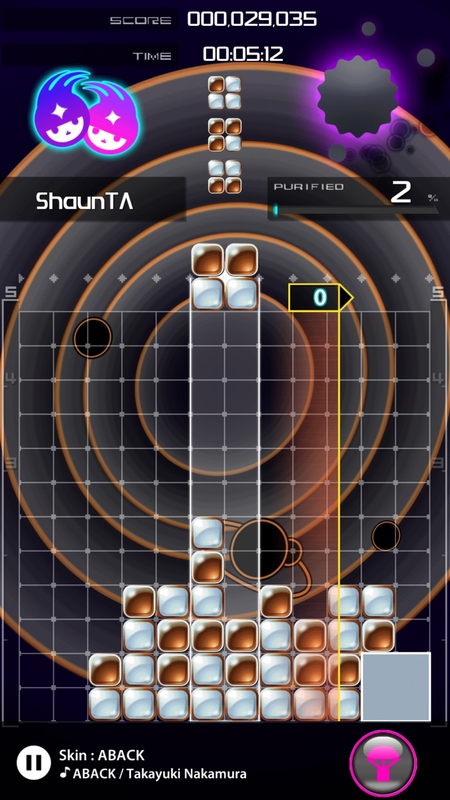 Though it was later updated with improved controls, the game was pulled years ago, leaving iOS gamers without any Lumines at all. Given the trajectory of puzzle games on the platform, it didn’t seem likely the game was going to make a comeback in a form anyone wanted. Sometimes miracles happen, though. In cooperation with the creator of the game, Tetsuya Mizuguchi, Japanese publisher Mobcast acquired the rights to Lumines and announced that they were working on two separate Lumines games for smartphones. There was the expected free-to-play variation, but alongside it, Mobcast was also working on a new paid Lumines game called Lumines: Puzzle & Music ($2.99). If that’s not lucky enough, the paid one has even released first. In Lumines, 2 x 2 blocks composed of two different colors drop in the field and begin falling. You need to move them left or right, rotate them, and drop them at the bottom of the playfield. As opposed to making lines as in Tetris, here you are trying to make 4 x 4 squares of a single color. When you do that, they will be marked for clearing. As you play, a bar is constantly moving across the field in line with the tempo of the current song. That bar will removed any marked squares you’ve matched up, and the remaining blocks will settle into place. You need to adjust your strategy based on the current speed of the bar, as slower songs will take longer to clear squares and faster ones will often only catch part of the matched square. Occasionally, a special square will drop that shuffles the field or removes all of one color it’s touching. Making combos of consecutive matches will significantly boost your score, so you’ll always want to keep an eye on how the other blocks will fall after each sweep of the bar. Lumines: Puzzle & Music is a fairly straight-forward single-player rendition of the game. You can play through the game’s albums, which have you going through a series of skins each with their own look, sound, and tempo, or you can simply choose any skin you’ve unlocked and work away at it endlessly. You’ll have to clear the skin first in album mode if you want to play it individually, however, and certain skins are only available on higher difficulty settings. Basically, the core of the game involves beating an album on whatever the highest available difficulty is, unlocking all the skins you can, then going back on the next difficulty level you’ve unlocked to try and scoop up more. There are two albums available right now. Puzzle & Music is a collection of eight brand-new skins, while Classic holds six favorite skins from the original PSP game, including the rarely-seen Shinin’ by Mondo Grosso. Luckily for those who just want to relive their memories, the classic album is fully unlocked by default. It’s nice to hear some of these songs again, though a few of them have made it into nearly every subsequent release. The new batch of skins in Puzzle & Music are more than worthy to hang with the older ones, however, demonstrating that same blend of eye-catching, often bizarre visuals with rhythm-heavy, catchy tunes. While it feels like a walk back from the approach Electronic Symphony took to its soundtrack, I’m quite content to have a more traditional selection for a mobile version I hope will stick around for a while. Waiting at the end of the difficulty rainbow is an endless mode for each album, so there’s always a reason to come back. Puzzle & Music hasn’t ditched everything from Electronic Symphony, however. While you’ll unlock music in the traditional fashion, the experience points system from Electronic Symphony makes a return. You’ll unlock avatars, each of which has their own special ability you can activate during play. As you play the game with those avatars, they’ll level up, increasing the effect of that ability. To tell the truth, I tended to forget about those abilities most of the time, but it adds a fine extra element to the meta-game. Not that Lumines needs it, mind you, but you can’t make a game without experience points in this day and age, it seems. While the game currently has no additional IAP available, I certainly wouldn’t be opposed to more albums being added in that way. I’d love to have packs with some classics like Heavenly Star or the holiday-themed skins. I suppose Lumines looking and sounding good is nothing new. Even the previous iOS version nailed those aspects right out of the gate. No, I suspect what many are concerned about is how well the game controls. 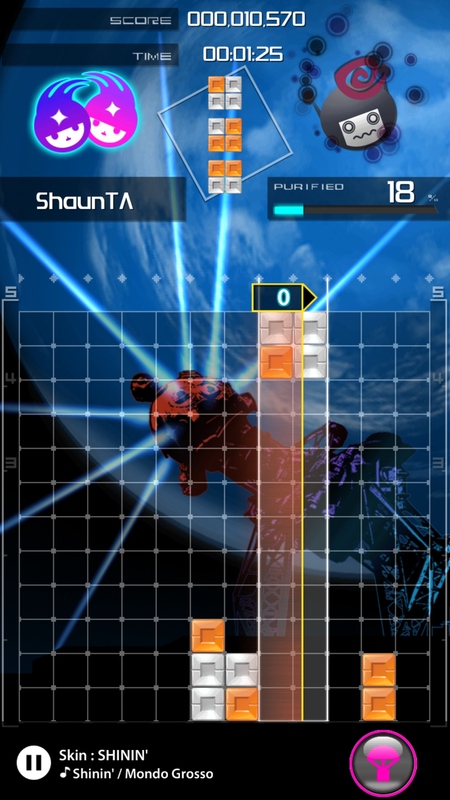 I think what we’ve got in Lumines: Puzzle & Music is about as good as we’re ever going to get with touch controls. You can move the blocks left and right by dragging your finger, a quick swipe down will drop them, and a tap on the screen rotates them in whichever direction you’ve set in the options. It works a lot better than the original controls of Touch Fusion, and at least a little better than the improved controls that were patched in later. It helps that the game is played in portrait mode rather than landscape. It’s easier to get blocks where you need them to go before they hit the ground since your finger doesn’t need to travel as far. Things can still get a little dicey during skins with a speedy tempo, but I’m not sure what can be done about that without cutting those kinds of skins altogether. It plays and feels like Lumines should for the most part, and that makes it an odd duck in the App Store of today. While most puzzle games on iOS today attempt to ape the successful King formula of a thousand ultra-hard stages that last about a minute each, Lumines is going to ask for more of your time. Just as it has ever been, it’s common for a single session to last upwards of a half hour or more. The game is trying to put you into a groove, after all. It does that job admirably, but it also means that if you’re looking for a quick thrill during a short break in your day, Lumines is probably not going to be the game you fire up. Save it for later, when you’re curled up in a comfortable position with some headphones on. Really get into it. That aspect is simultaneously one of the greatest attractions of Lumines and one of its biggest turn-offs, depending on what you’re looking for. Puzzle games rarely make such demands of players these days. Still, if you allow yourself the time and attention to get into Lumines, there’s really nothing quite like it. Almost all puzzle games seek to put you in the proverbial zone, but Lumines has always tried a little bit harder to create that effect, and Puzzle & Music isn’t about to break that pattern. If you have bad memories of Touch Fusion, this will wash the taste of that game out of your mouth. This is the Lumines I suspect most of us have always wanted on our iOS devices. It’s a little light on gameplay modes and I’m not sure I could ever get enough skins to be satisfied, but Puzzle & Music nails the core gameplay and the exceptional aesthetics of the beloved series, and I’m not sure if we can realistically ask for more than that.